The Space Shuttle Endeavour deploying its mast in Earth orbit for the SRTM radar mapping of Earth's topography. During its 11-day mission, the space shuttle Endeavour orbited the Earth 16 times. 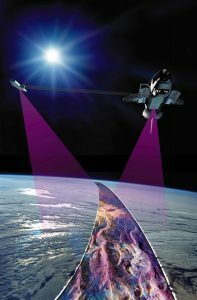 As part of this mission, it captured Earth’s topography at 1 arc-second (30 meters) for over 80% of the Earth’s surface. Using synthetic aperture radar and interferometry, SRTM has collected one of the most accurate digital elevation models of Earth. Now, this data is freely available on the USGS Earth Explorer. 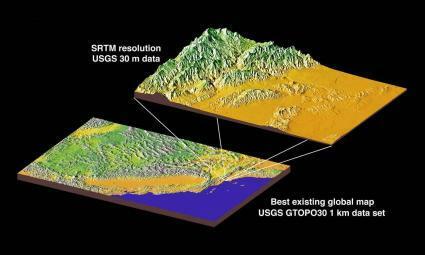 Before September 2014, the best available SRTM Digital Elevation Model (DEM) was 90 meter resolution. Now, the 30-meter (1 arc-second) resolution SRTM is publically available on the USGS Earth Explorer for most of the globe. This enhanced version presents the full resolution of the original measurements. The global digital elevation model has a spatial resolution of about 30 meters covering most of the world with absolute vertical height accuracy of less than 16 meters. Where can you download the SRTM data? In late 2014, the United States announced that it would release its highest possible resolution SRTM data to the public. Your best place to download SRTM tiles is through the USGS Earth Explorer. We have a guide how to download data from the USGS Earth Explorer to help you get started. Under the data sets tab, select Digital Elevation > SRTM > SRTM 1-ArcSecond Global. Add to your cart and download. For the SRTM data products, it has 2 levels of processing. First, the void-filled DEM fills in null values where it didn’t meet standard specifications. And secondly, the non-void version contains voids and have not been filled using interpolation and other sources of elevation. The SRTM payload was equipped on the Space Shuttle Endeavour. 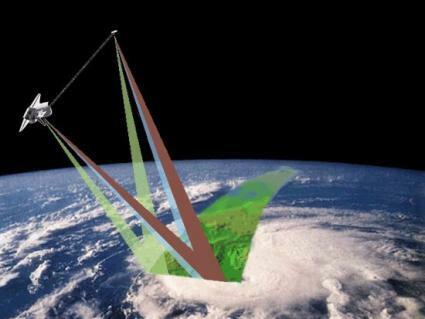 The Shuttle Radar Topography Mission (SRTM) uses inSAR which measures Earth’s elevation with two antennas. Using two radar antennas and a single pass, it generated a digital elevation model using interferometric synthetic aperture radar (inSAR). Because C-band radar struggles at penetrating dense vegetation, it can’t “see through” thick vegetation. This means that in heavily forested areas that SRTM mapped the top of the canopy. Even with studies comparing laser altimetry, SRTM did penetrate vegetation a bit, but not to the ground. However in sparse vegetation, it may have a return from the ground. In addition, all radar struggles with distortions like foreshortening, layover and shadow. NASA only needed 11 days to sculpt their impeccable SRTM 30-meter digital elevation model of the Earth. But why did NASA decide to collect topography? First, scientists use topography data in climate models because topography determines factors like air and water flow. Also, surface elevation is good indication of land formations and tectonic activity. If you want to design a cellular tower or a hydroelectric dam, you need to have accurate topography of the land. This is why the international scientific community has everything to gain in this mission which included German and Italian space agencies. Distance Decay: How Far Are You Willing to Travel? IKONOS provides panchromatic, natural-color, color-infrared and stereo images for cartographic, remote sensing and photogrammetric applications. The agile Pleiades satellite constellation is comprised of Pleiades 1A and 1B. They offer dynamic image acquisition at 50cm panchromatic & 2m multispectral. They also include an accessible RESTful API for developers. I’ve found it to be much more approachable than Earth Explorer (imho).